Parent company Snap Inc.'s first quarter financial results for 2018, released May 1, disappointed investors, sending the company's share price down to a record low. 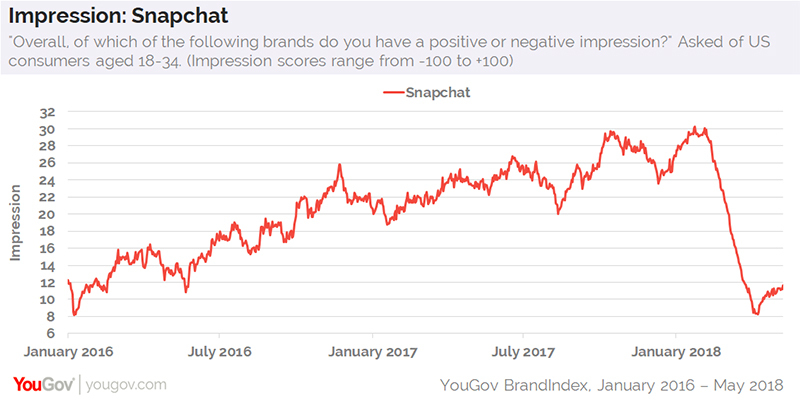 Snapchat’s slowing growth and lower-than-expected revenue are, in part, likely due to the app’s redesign disappointing another key group: millennials. Fewer millennials report talking about the app with friends and family these days, too. At present, only 25% of US consumers aged 18-34 say they've discussed Snapchat in the past two weeks. Last January, that number stood 10 percentage points higher, at 35%.